Diagnosis of mental illness involves a series of direct interaction with patient, observing them, and subsequently performing imaging and/or biochemical investigations. In addition, the health professionals employ one or many validated scales to identify and quantify the impact of alleged illness on domains of mental well-being. The use of diagnostic scales or inappropriate verbal questioning by a nonqualified professional may lead to under and false diagnosis posing a further burden to already burdened existing health-care system. Employment status of a mentally ill person (past/those under treatment) is a major part of the rehabilitative process of such people. Employability of a mentally ill person could be perceived as their acceptability into the mainstream society as well as an indicator of control of the illness. When a mentally ill person is employed, besides the financial independence that it brings, it gives a boost to the self-esteem, social acceptance, integration, and a sense of well-being – all features that are essential for mental well-being as well as known to impart a therapeutic benefit. Census is a well-known, large-scale, accepted exercise of enumerating population and their characteristics and has been since biblical times. The recent Indian census was in 2011, which undertook an attempt to include enumerate and characterize the number of its citizen living with mental illness. This was due to the enactment of disability act of India, 1995 and similar acts. Besides this fact, enumeration of mentally ill has been a part of Indian census since its colonial past. Census exercise employs educated teachers, supervised by well-educated, informed, and competent authorities. The figures projected by the 2011 census authority of India as a measure mental illness came under severe criticism from mental health professionals and is reported to grossly understate the number of people with mental illness in its broadest definition. The origins of such gross difference could stem from planning to execution of the census. However, these disability data are being currently cited in literature for vulnerable population studies, but the mental illness segment is not being used owing to the negative comments that it attracted. The associated data also included the employment of such individuals. These self-reported data, by all Indian households, are a treasure trove of data that may serve as an indirect (proxy) reflection of willingness to declare or accept mental illness, their employment status (as documented). To the best of our knowledge, no in-depth analysis of this has been carried out. The present study intends to study the (a) demographic characters (age group, gender, place of residence - urban/rural) of Indians living with mental illness as per se lf-report, (b) employment status of such SRMI person's in India, and (c) association of such factors in employability of SRMI persons in India. This is a secondary data analysis drawn from tabulated, detailed data drawn from the 2011 census exercise of India. This was downloaded from the website – http://www.censusindia.gov.in/. Details of methodology, definition used, and method of evaluation employed are accessible from the same web portal as they are beyond the scope of this manuscript. All definitions employed by the census authority were retained and used in this study. From the downloaded frequency (number of SRMIs) in excel chart of SRMI people's data, age group (0–14 years; 15–59 years; 60 and above; not known), gender (male; female), states (as defined by Government of India), and area (urban/rural) were collected for this study. The employability was characterized as currently employed (education for the younger age), marginally employed – in past 3 months, marginally employed (3–6 months), and not employed. Such collected data were entered appropriately and analyzed using Social Package for Statistical Services, version 20 (SPSS, IBM, Chicago, IL, USA). Descriptive statistics are presented for the predictor and outcome variables after weighing the data for all the variables. We purposefully did not include the Indian state data for further model analysis. There is well-documented disparity existing among the accessibility/availability of mental health professionals in various states and parts of India, which contributes to the mental health delivery. This known fact compelled us to take the decision to not including this vital data into consideration for further analysis. As we had only frequency data, we weighed all cases and variables. This weight was applied the same throughout the study. Weighting cases are a statistical procedure that are undertaken to restore the sample on a number of (social-demographic) variables the same distribution as observed in the population. This weighted data when used to make subsequent data analysis accounting for importance or weight to cases/variables, which would serve to correct over or under representation of characteristics so as to make the data, a more representative of the general population. We performed the Chi-square test to identify the difference in number of SRMIs in terms of area, age groups, gender as compared with their employment status for statistical significance. For confirming the results and effect of each parameter on the outcome, we undertook a log-linear type of statistical analysis. The log-linear is a statistical procedure that studies the number (counts) into each cross-classification category called a cell, and each categorical variable is called a factor (age, gender, area, and work nature in this manuscript). The dependent variable is the number of workers in another cell. This statistical process estimates the maximum likelihood of each parameter using sequential inputs in the model. The log-linear model starts with all of the one-, two-, three-, and higher-way associations, and then eliminates as many of them as possible while still maintaining an adequate fit between expected and observed cell frequencies called as a partial association. In log-linear modeling, the full model that includes all possible main effects and interactions fits the data exactly, with zero residual deviance. One then assesses whether a less full model fits the data adequately by comparing its residual deviance with the full model. We attempted to identify the most parsimonious model that fits the data (i.e., the simplest model that still represents the data well). As the number of variables starts to increase with each of the data, the complexity of the analysis (with two-way or three-way or four-way interaction) can become overwhelming with a seemingly monstrous number of possible interaction effects. Hence, we employed a hierarchical model selection method, checked and proceeded to perform the general log-linear regression. These models will explain the influence of cell count on levels of categorical variables while modeling their interactions. The term parameter estimation refers to the process of using the factors (variables, in this case – area, gender, employment status) to estimate the outcome parameters (number of SRMIs). This will help to reveal the fit of model and the factors in the present model. P≤ 0.05 was taken as significant. A total of 722,880 SRMI were reported, making a prevalence of 0.02% of SRMI. Using the data collected and methodology stated, the descriptive statistics of the Indian SRMI people are depicted in [Table 1]. [Table 2] describes the differences in employability status of the self-declared mentally ill patients by the studied demographic factor. Data reveal that majority (68.6%) of the SRMI people resides in rural areas, in the economically productive age group of 15–59 years (75.88%), and often males (57.51%). Of the SRMI as reported in the data, 78.62% were not employed while 2.4% of them were currently employed. The employability frequency distributions of SMRIs were statistically different in terms of area, age group, and gender with significance [Table 2]. A log-linear analysis was performed to determine a hierarchical unsaturated model for the associations between age group, gender, work nature, resident area, and the number of people (with mental illness) employment status. From the data, overall 722,880 “self-reported mentally ill people” data were studied, in a valid 2240 cells. Initially, a partial association was tested as a part of the log-linear analysis, which yielded partial correlation coefficients that effectively sums the linear relationship between two variables to ensure controlling the effect of other variables. If the relationship is not significant, further assessments are not required. As seen in [Table 3], all combinations of two- and three-way of factors were statistically significant. This reflects the fact that these factors (area, age group, gender, and work nature influences the count of the SRMIs) are identified and incorporated in this model. An unsaturated model was chosen using SPSS Statistics' hierarchical log-linear model selection procedure with a backward elimination stepwise procedure. This produced a model that included all main effects. Partial likelihood ratio Chi-square is presented in [Table 3] and log-linear parameter estimates in [Table 4]. In urban areas, gender and age group were significantly influencing the employment status except for 15–59 years, marginally employable/not employed males; above 60 years fully employable males (P = 0.378). In the urban areas, in the 15–59 age group, marginally employed (past 3 months and 3–6 months) and not employed were not statistically significant (except for females in case of marginally employable [3–6 months] and not employed category). Similarly, in the above 60 years of age, fully employable SRMI of an urban male was not statistically significant (P = 0.521). [Table 4] shows the parameter estimates for the model terms. In instances, when the value of P≥ 0.05 for the above-discussed case suggesting that parameter combination has no effect on number of SRMIs. Similarly, in rural areas, in the age group of 0–14 years, in marginally employable (past 3 months) of either gender, no significance was achieved. In the age group of above 60 years, marginally employable (3–6 months) was not statistically significant, indicating that age and gender did not contribute to the numbers of SRMIs. Work or employment for mentally ill is considered to be therapeutic and deemed essential for such person's sustenance and well-being. In addition, employment plays a central role in terms of sociocultural, economic dimensions. It also serves to provide a basis of identity and for mentally ill, serves as a marker of integration of them into mainstream society. A measure of success of treatment of mentally ill person is the complete integration of the person into the society and enabling his/her employability. In this regard, several novel concepts and recommendation have been proposed by nongovernmental organizations to render employment to the mentally ill persons. As India lacks a national-wide profiling of prevalence of its mentally ill patients, the exact prevalence and employability status of such persons rely largely on locoregional- or institutional-based studies. The 2011 census of India recorded the self-reported disabilities among which mental illness and retardation found a place as distinct entities. However, this was only based on SRMI rather than professional diagnosis. Such SRMIs are error prone and known for severe underreporting of mental illness. Only the most severely ill are often disclosed, and those with minor mental illness often go unreported. The same has been pointed out by several mental health experts. 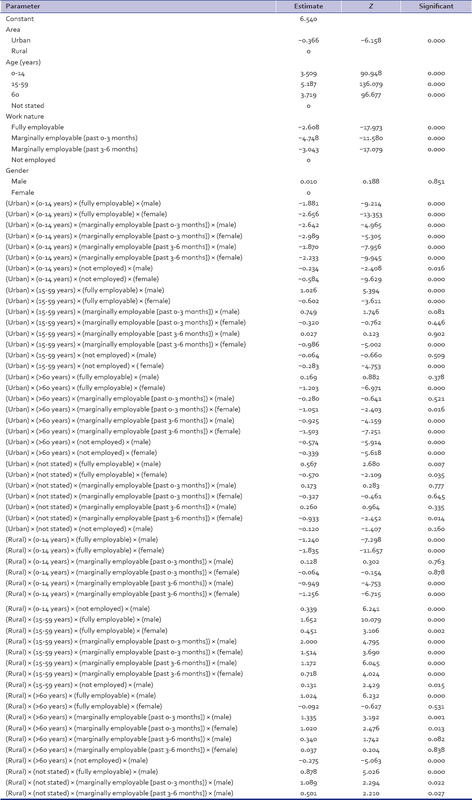 However, these data can be considered as a valid, robust indicator of number of self-declarations, and/or their acceptability of mental health status to community at large, particularly in the absence of valid large scale data., In addition, the database has been used to study vulnerable population. As expected, 75% of SRMIs was in the economically productive age group of 15–59 years. As in other previous reports, a marginal increased prevalence (57.51%) of SRMI was observed among males. This observation has been noted in previous epidemiological studies with smaller sample size and defined geographical location.,, The study indicated that of all the SRMIs, 78.62% (n = 568346) were not employed and 13.15% (n = 95053) were currently employed. This study is probably the first of its kind, to the best of our knowledge, to study the employment status of SRMI persons in the Indian subcontinent. The high rate of unemployment for these marginalized persons warrants immediate attention to create healthy, special job opportunities and forums exclusively for this purpose. Previous reports have specific recommendations in creations of special job opportunities, reservations, and several other rehabilitative measures. They have considered the rehabilitative psychiatry as essential, core feature, and end of active psychiatric treatment. Such policies need to be considered for immediate implementation. 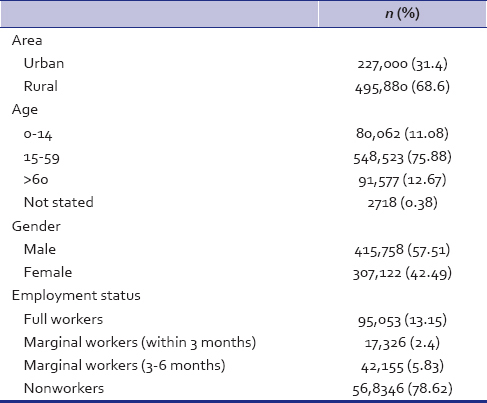 From [Table 2], it is evident that in rural areas, SRMIs fare well in terms of employment. They are relatively more employed, and nonemployment status is lesser (75.45%) as compared to urban SRMIs (85.55%). Although the factors such as lesser availability of mental health professionals in rural areas, relatively better employment status of SRMIs in rural setting indicates the existence of better support system (for SRMIs) in rural areas than in urban areas.,, In addition, further studies that factor the grade, type of mental illness, and financial consideration need to be performed to ascertain this finding. As expected, the nonemployed status was highest among the younger and older age group. Similarly, male SRMIs were better employed than the female counterparts. The extent of the influence was studied using the log-linear analysis. The basic demographic factors such as age, location, and area have been shown as vital factors for the employability of the individuals. The gender males as compared to females do not give a statistically significant difference [Table 3] and [Table 4]. This indicates that SRMIs, irrespective of their gender, are not being employed at a larger scale and no gender disparity exists. The model indicates that in the urban areas, SRMIs in productive age group of 15–59 years, the marginally employable individual's numbers does not have statistical significance. This indicates that one of the factors is a contributory; probably the gender component is responsible for this phenomenon. The gender disparity in terms of employment is not unique among Indian population,,, and the same has been probably reflected in this study. In addition, this phenomenon is much pronounced among elderly and in rural areas as reported in other studies. The nonsignificance associated with marginal employment both in urban and rural areas indicates the urgent need of the mental health system support to SRMIs and serves as a proxy indicator of the recent deterioration of their mental health leading to their downgrade of employment status. With a timely professional intervention, this phenomenon could be reversed, at least in part. In rural areas, perhaps, in spite of known predisposing factors, such as poverty, lack of mental health support system, the probable existence of a strong support system contributes to higher employment and thus relatively better social status and acceptance of SRMIs. In this context, two factors need to be considered. (1) As this is a self-reported finding, the number of declaration would be low and logically be expected from severe mentally ill population only; (2) the current unemployment rate or status among severely mentally ill Western population is placed at 75%–90%. Considering both factors, it can be argued on sound facts that in spite of severe shortage of mental health professionals, Indian data of employment of mentally ill are comparable to international standards. To the best of our knowledge, this is the first study that identifies the SRMIs in India and their employment rates. This will give an estimate for policy framers to formulate more inclusive policies for mentally ill persons, especially for employment. Although the authenticity of this data has been questioned, they may yield some clue to some social-related question such as (1) self-reporting (self or family) of mental illness across India, (2) the employment status of such SRMIs, and (3) the influence of certain factors such as age, gender, and place of habitation. These questions are vital for policy formulations, especially those related to mental health care and delivery as well as rehabilitation and employment policies. Future studies in this direction can rely on the robust estimates to formulate specific plans including but not restricted to questionnaires and surveys. In addition, the states can draw the mental health professional requirements based on these basic, robust estimates. In this regard, the ongoing National Mental Health Survey under National Institute of Mental Health and Neurosciences may yield more clues. The present study has its limitations and bias of underreporting. In the absence of a structured, population-based study, this would provide a robust estimate for the policy framers and mental health professionals. This will help them to design and suggest large-scale studies in this direction while aiding to formulate interim measures. Authors would like to acknowledge the help of Prof. T. Rooban, Marundeeshawara Oral Pathology Services and Analytics, Chennai, and Ms. Hemalatha for essential inputs to the manuscript. Spitzer RL, Williams JB, Kroenke K, Linzer M, deGruy FV 3rd, Hahn SR, et al. Utility of a new procedure for diagnosing mental disorders in primary care. The PRIME-MD 1000 study. JAMA 1994;272:1749-56. Kessler RC, Barker PR, Colpe LJ, Epstein JF, Gfroerer JC, Hiripi E, et al. Screening for serious mental illness in the general population. Arch Gen Psychiatry 2003;60:184-9. Short ME, Goetzel RZ, Pei X, Tabrizi MJ, Ozminkowski RJ, Gibson TB, et al. How accurate are self-reports? Analysis of self-reported health care utilization and absence when compared with administrative data. J Occup Environ Med 2009;51:786-96. Ramasubramaniam C. Special employment exchange for persons with psychiatric disability. Indian J Psychol Med 2008;30:75-9. Available from: http://www.censusindia.gov.in. [Last accessed on 2016 Sep 01]. Sarin A, Jain S. The census of India and the mentally ill. Indian J Psychiatry 2012;54:32-6. Available from: http://www.timesofindia.indiatimes.com/city/mumbai/Census-under-reports-mental-illness-count/articleshow/29025609.cms. [Last accessed on 2016 Sep 01]. Velayutham B, Kangusamy B, Joshua V, Mehendale S. The prevalence of disability in elderly in India – Analysis of 2011 census data. Disabil Health J 2016;9:584-92. Laerd Statistics. Loglinear Analysis using SPSS Statistics. Statistical Tutorials and Software Guides. Available from: https://www.statistics.laerd.com/. [Last accessed on 2016 Sep 01]. Introduction to SAS. UCLA: Statistical Consulting Group. Available from: http://www.ats.ucla.edu/stat/sas/notes2/. [Last accessed on 2016 Sep 30]. Leroux J, Rizzo JA, Sickles R. The role of self-reporting bias in health, mental health and labor force participation: A descriptive analysis. Empir Econ 2012;43:525-36. Salve H, Goswami K, Sagar R, Nongkynrih B, Sreenivas V. Perception and attitude towards mental illness in an urban community in South Delhi – A community based study. Indian J Psychol Med 2013;35:154-8.